Note: This is the bound book only and does not include access to the Enhanced Pearson eText. To order the Enhanced Pearson eText packaged with a bound book, use ISBN 0133783723. This comprehensive, well-organized introduction to hearing and balance disorders gives students a number of vital tools to help them better understand, retain, and analyze the material. 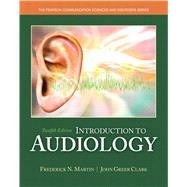 Now available as an interactive eText with a number of accompanying advantages, Introduction to Audiology, 12/e by Martin and Clark continues to update the material to keep content current with recent research, while retaining and improving a user-friendly approach to the topics and an abundance of how-to information which shows the rewarding, fascinating aspects of a career in audiology. This new edition includes 20 video clips interspersed throughout, a variety of interactive test questions, expanded Evolving Case Studies, a list of frequently asked questions, and the use of color to enhance selected illustrations and photographs. The Enhanced Pearson eText features embedded video to illustrate key concepts and pop-up assessments to help students assess their proficiency. * The Enhanced eText features are only available in the Pearson eTextformat. They are not available in third-party eTexts or downloads. Frederick N. Martin is the Lillie Hage Jamail Centennial Professor Emeritus in Communication Sciences and Disorders, The University of Texas at Austin. In addition to the twelve editions of Introduction to Audiology, six of which were co-authored by Dr. John Greer Clark, Martin has authored seven books, co-authored another seven, edited thirteen, and co-edited three. He has written 25 chapters for edited texts, 122 journal articles, 104 convention or conference papers and five CD ROMs. He served as a reviewer for the most prominent audiology journals and for years co-edited Audiology, A Journal For Continuing Education. John Greer Clark is Associate Professor of Communication Sciences and Disorders at the University of Cincinnati. A presenter at local, national, and international association meetings and conventions, Dr. Clark has served as faculty for the Ida Institute, associate editor of HEARSAY and as editorial consultant for the International Journal of Audiology, Ear and Hearing, Audiology Online and Language, Speech, and Hearing Services in the Schools. His more than 70 publications include three edited textbooks, a variety of co-authored texts, two single-authored books, seven book chapters, and a range of journal articles on various aspects of communication disorders. His current research interests are within the areas of adult audiologic rehabilitation, audiologic counseling, and animal audiology. Introduction to Audiology: 4 out of 5 stars based on 1 user reviews.